One of the greatest public health achievements in recent decades has been our accelerated progress in reducing cigarette smoking – the No. 1 cause of preventable death in the United States. In fact, smoking rates have fallen so sharply that a recent analysis in The New England Journal of Medicine (NEJM) found the U.S. is on a path to eliminate smoking by 2035 – if we continue to fully and effectively implement tobacco-control strategies that are proven to work. We should seize this opportunity to save lives, improve our nation’s health and lower healthcare costs for everyone. 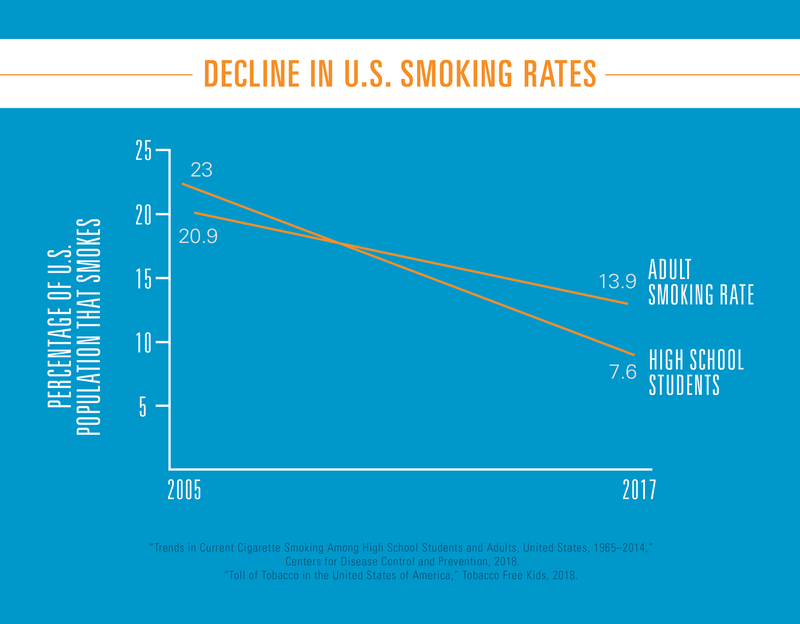 Since 2005, the U.S. has cut the adult smoking rate from 20.9 percent to 13.9 percent in 2017 and the smoking rate among high school students from 23 percent to 7.6 percent from 2005 to 2017. This progress is no accident. It stemmed from implementing a series of strong strategies based on strong science. The federal government has taken the lead with the largest-ever increase in the federal cigarette tax, a landmark law granting the FDA regulatory authority over tobacco products, expanded coverage for tobacco cessation treatments in private and public health plans, and unprecedented advertising campaigns to prevent kids from using tobacco and encourage adults to quit. States and localities have also increased tobacco taxes, passed laws to require smoke-free public areas and workplaces, and funded tobacco prevention and cessation campaigns. But continued progress is far from inevitable. It will require sustaining and expanding on the successful actions that have been taken and must remain a national priority because tobacco use is a driving force behind many of the biggest health challenges facing our nation today. Tobacco use still kills nearly half a million Americans and costs us about $170 billion in direct medical healthcare spending each year in addition to the $151 billion caused by loss in productivity. In fact, smoking kills more people than alcohol, AIDS, car accidents, illegal drugs, murders and suicides combined. What’s more, tobacco use causes about a third of all deaths from lung cancer and heart disease (although smoking declines have also prevented about 1.3 million cancer deaths since 1990, according to the CDC). Tobacco is a major cause of health disparities, with smoking rates especially high among people with low incomes and less education. And smoking during pregnancy is a key contributor to poor maternal and infant health. Thanks to our enormous progress against tobacco, it is truly within our reach to win the fight against this public health scourge and guard against alternatives that are flooding the market. Doing so will require further study and strong leadership from all levels of government and all segments of our society.